ONE-SHOTS DANCE HOUSE VOL. 1 – Welcome to EZ Edit Music ! With our non-looping "One-Shots" library series, our music tracks are available in a "stereo-mix only" version, which includes both .wav and .mp3 files. These music tracks have defined beginnings and endings. Durations are indicated with each song title. 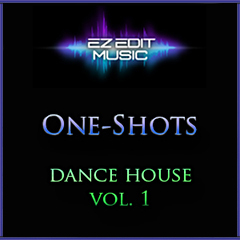 The "One-Shots Dance House Vol. 1" collection is well-suited for urban themes, nightclubs, entertainment venues, fashion etc. ; and for those projects requiring a defined song ending. "Hit The Floor" (01:50) Stereo-mix only. "Clean Getaway" (01:48) Stereo-mix only. "Like I Said" (01:43) Stereo-mix only. "Cool Customer" (01:57) Stereo-mix only.